Long anticipated by fans of Audi's S-Line performance cars and by driving enthusiasts in general, the 2009 Audi TTS will finally reach U.S. showrooms by the end of the year. This will be the first S model for Audi's sports car since the TT was launched in 1998, and at first blush the raw horsepower numbers might disappoint some. The power increase from standard TT models is not as significant as that in other S-Line cars. Yet indicators suggest that the speed and response S buyers expect are here, and thanks to the TTS's light weight, efficient transmission and relatively small turbocharged engine, fuel mileage figures should be impressive. We might think of the TTS as a true high-performance sports car with a green conscience. 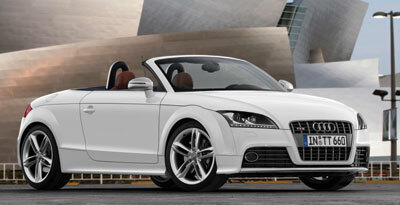 This hot-rod TT will be available as a hard-top Coupe or two-seat, convertible-top Roadster, like the standard TT models. Yet the TTS, which was unveiled at Detroit's North American International Auto Show in January, sports some subtle appearance tweaks that distinguish it from other TT models. Its standard lightweight alloy wheels are upgraded from 17 to 18 inches in diameter, and 19-inch rims are optional. The headlights are jewel-like bi-xenon projector beams, with a unique ribbon of LED bulbs running horizontally underneath; the low-energy LEDs operate as the daytime running lights. The front and center portions of the TTS body and frame are manufactured from aluminum, and curb weight for the coupe is 3075 pounds. That's a few hundred pounds lighter than most similarly sized, similarly specified sports cars, even with the TTS's standard quattro all-wheel-drive system. The most prominent TTS distinction lies under the hood, where a 2.0-liter, turbocharged four-cylinder engine generates the power that makes it go. This inline-4 features direct fuel injection and higher boost pressure than Audi's other turbo engines. The TTS turbo also gets a number of durability enhancements, including heavy-duty pistons and connecting rods. It delivers 272 horsepower and 258 pound-feet of torque, or 22 horsepower and 22 pound-feet more than the most powerful engine in current TT models. While other markets will get a conventional six-speed manual transmission, there will likely be only one choice in the United States: Audi's six-speed, dual-clutch manu-matic. This transmission works like a manual with an automatic clutch system, rather than a conventional automatic. Its paddle-shift feature delivers razor-sharp, race car-style gear changes, but it also has a fully automatic mode. The all-wheel-drive system has been beefed up for even faster response directing power between the front and rear wheels. The TTS will not be offered with front-wheel drive, as the standard TT is. Audi claims the TTS Coupe goes from 0 to 62 mph in 5.4-seconds, with top speed governed at 155. The acceleration figures roughly match those for a Porsche 911 Carrera. Yet, thanks to the TTS's light weight and other efficiencies, Audi also promises a combined mileage rating greater than 29 mpg. That's impressive in a car of the TTS's anticipated capability. To complete the performance package, Audi has equipped the TTS with its adaptive magnetic dampening suspension, which uses magnets to almost instantaneously adjust shock-absorber stiffness to optimize handling capability without wrecking ride quality. The electronic stability control features an aggressive track mode that will allow drivers to slide the car in turns. The brake calipers are painted gloss black and prominently visible through the spoked rims. Inside, the TTS gets heavily bolstered sport seats upholstered with leather and Alcantara. The information display includes a timer to record lap times or acceleration figures. The Roadster's top opens and closes with the touch of a button. The Coupe, meanwhile, offers 24.7 cubic feet of cargo volume, which is substantially more than you'll find in the trunk of a large luxury sedan like the Mercedes-Benz S-Class and should leave room for a couple of tour-sized golf bags. Audi expects the first TTS deliveries to customers in the United States by the end of November 2008.